On September 3, 1984 in Sharpeville, South Africa, a peaceful demonstration about rent erupted into a bloody battle between white police and black residents. The Apartheid government arrested, tried, and sentenced to death six people for allegedly killing a town councillor. After an unprecedented international campaign, the prisoners were ultimately granted clemency and released. In the Shadow of Sharpeville explores the case in comprehensive, personal detail. 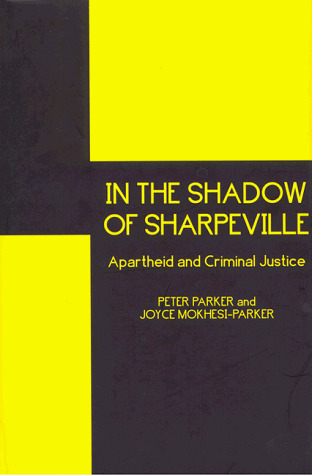 Among the "Sharpeville Six" was Francis Mokhesi, whose sister, Joyce Mokhesi-Parker and coauthor, Peter Parker, here scrutinize the crime and its investigation by the police, the prosecution's case, and the response of the defense. They argue convincingly that the convictions were obtained because of the inventiveness of the judge and the selective attention paid to the evidence. The authors further examine the corrupting effect of the system on its victims, using Francis Mokhesi's letters from death row to show how an individual responds to the pain and fear of impending execution. In the Shadow of Sharpevill reveals the obduracy of a regime which refused to understand how indefensible its behavior had become and which still believed that a state could declare war on its people and win.